Definition at line 14 of file CAnnotation.h. Definition at line 17 of file CAnnotation.h. Definition at line 81 of file CAnnotation.cpp. Definition at line 89 of file CAnnotation.cpp. Definition at line 97 of file CAnnotation.cpp. Definition at line 211 of file CAnnotation.cpp. References CCopasiMessage::ERROR, isValidXML(), MCAnnotation, and mUnsupportedAnnotations. Definition at line 32 of file CAnnotation.cpp. Referenced by CMIRIAMInfo::load(), CQNotes::load(), CMIRIAMInfo::save(), CQNotes::save(), and CQMiriamWidget::showEvent(). Definition at line 59 of file CAnnotation.cpp. Reimplemented in CModel, CEvent, CReaction, CModelEntity, CFunction, and CModelParameterSet. Definition at line 103 of file CAnnotation.cpp. Referenced by CFunction::getKey(), CModelEntity::getKey(), CReaction::getKey(), CEvent::getKey(), and CMIRIAMInfo::save(). Definition at line 117 of file CAnnotation.cpp. Referenced by CEvent::CEvent(), CFunction::CFunction(), CModelEntity::CModelEntity(), CReaction::CReaction(), CModelExpansion::duplicateCompartment(), CModelExpansion::duplicateEvent(), CModelExpansion::duplicateGlobalQuantity(), CModelExpansion::duplicateMetab(), CModelExpansion::duplicateReaction(), CQRDFTreeView::enterProtected(), CMIRIAMInfo::load(), CCopasiXML::saveAnnotation(), CQMiriamWidget::showEvent(), test000092::test_miriam_export_8(), test000092::test_miriam_export_9(), test000092::test_miriam_import_1(), and CSBMLExporter::updateMIRIAMAnnotation(). Definition at line 124 of file CAnnotation.cpp. Referenced by CModelExpansion::duplicateCompartment(), CModelExpansion::duplicateEvent(), CModelExpansion::duplicateGlobalQuantity(), CModelExpansion::duplicateMetab(), CModelExpansion::duplicateReaction(), CModel::initObjects(), CQNotes::load(), CQNotes::save(), CCopasiXML::saveAnnotation(), and CSBMLExporter::setSBMLNotes(). 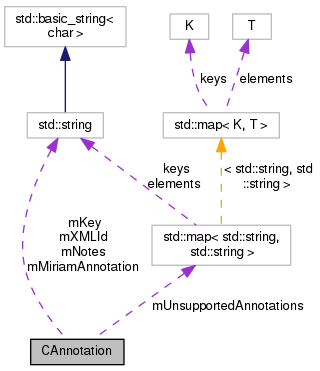 Retrieve the unsupported annotations in xml format. Definition at line 201 of file CAnnotation.cpp. Referenced by CCopasiXMLParser::ReactionElement::end(), CCopasiXMLParser::EventElement::end(), CCopasiXMLParser::ModelElement::end(), CCopasiXMLParser::FunctionElement::end(), CCopasiXML::saveAnnotation(), and CSBMLExporter::setSBMLNotes(). Definition at line 206 of file CAnnotation.cpp. Definition at line 275 of file CAnnotation.cpp. References BUFFER_SIZE, CCopasiMessage::getLastMessage(), CExpatTemplate< CType >::parse(), and CCopasiMessage::size(). Referenced by addUnsupportedAnnotation(), and replaceUnsupportedAnnotation(). Definition at line 129 of file CAnnotation.cpp. References CRDFUtilities::fixLocalFileAboutReference(), mMiriamAnnotation, mNotes, and mXMLId. Definition at line 260 of file CAnnotation.cpp. Definition at line 239 of file CAnnotation.cpp. Definition at line 108 of file CAnnotation.cpp. References CRDFUtilities::fixLocalFileAboutReference(), mMiriamAnnotation, and mXMLId. Referenced by CEvent::CEvent(), CFunction::CFunction(), CModelEntity::CModelEntity(), CReaction::CReaction(), CModelExpansion::duplicateCompartment(), CModelExpansion::duplicateEvent(), CModelExpansion::duplicateGlobalQuantity(), CModelExpansion::duplicateMetab(), CModelExpansion::duplicateReaction(), CCopasiXMLParser::ModelParameterSetElement::end(), CCopasiXMLParser::ReactionElement::end(), CCopasiXMLParser::EventElement::end(), CCopasiXMLParser::ModelElement::end(), CCopasiXMLParser::FunctionElement::end(), SBMLImporter::importMIRIAM(), CMIRIAMInfo::save(), CQMiriamWidget::showEvent(), and test000092::test_miriam_export_7(). Definition at line 120 of file CAnnotation.cpp. Referenced by CModelExpansion::duplicateCompartment(), CModelExpansion::duplicateEvent(), CModelExpansion::duplicateGlobalQuantity(), CModelExpansion::duplicateMetab(), CModelExpansion::duplicateReaction(), CCopasiXMLParser::ReactionElement::end(), CCopasiXMLParser::EventElement::end(), CCopasiXMLParser::ModelElement::end(), CCopasiXMLParser::FunctionElement::end(), SBMLImporter::importNotes(), CModel::load(), and CQNotes::save(). Key of the model entity. It is stored here, but constructed in the derived classes. Definition at line 119 of file CAnnotation.h. Referenced by CCompartment::CCompartment(), CEvent::CEvent(), CFunction::CFunction(), CMetab::CMetab(), CModelEntity::CModelEntity(), CMetab::compile(), CReaction::CReaction(), getKey(), CModel::getKey(), CModel::initObjects(), ~CAnnotation(), CCompartment::~CCompartment(), CEvent::~CEvent(), CFunction::~CFunction(), CMetab::~CMetab(), CModel::~CModel(), and CReaction::~CReaction(). Definition at line 130 of file CAnnotation.h. Referenced by getMiriamAnnotation(), operator==(), and setMiriamAnnotation(). Definition at line 125 of file CAnnotation.h. Referenced by getNotes(), operator==(), and setNotes(). The annotations which are not supported by COPASI. Note, the name is enforced to be unique. Definition at line 141 of file CAnnotation.h. Referenced by addUnsupportedAnnotation(), getUnsupportedAnnotations(), removeUnsupportedAnnotation(), and replaceUnsupportedAnnotation(). Definition at line 135 of file CAnnotation.h. Referenced by operator==(), and setMiriamAnnotation().